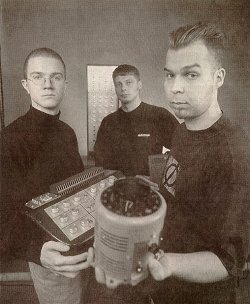 The one-time third member of Panasonic, Sami Salo, finally joined in 1994 after having come to contact with Vainio and Väisänen through Sähkö (for which Salo had recorded a 12″ as Hertsi), and their first EP was also released that year. Paul Smith, the main man of Mute’s sublabel Blast First, saw Panasonic’s gig in England at a club called Vox in autumn 1994, and eventually signed the act to his label. Pan sonic’s performance at New York’s Disobey club of Knitting Factory in early 1995 also increased duo’s popularity Stateside. Panasonic performed at the end of 1995 in a car park in London’s East End with a notorious Audio Weapons Armoured Car System — or ‘Advanced Acoustic Armaments’ sound system rigged up on an armoured car — featuring a 5K turbo sound PA which was built and developed by Jimmy Cauty of The KLF fame. According the rumours the device was similar to those the police’s riot forces were using, causing low frequency sounds to accelerate the rioters’ bowel movements, thus incapacitating them by making them mess their pants… (As Jimmy Cauty is known as the master of disinformation, these rumours should be taken with the proverbial grain of salt.) At a recent Ars Electronica festival of Linz, Austria, Pan sonic played in a train which circulated around an industrial area. Pan sonic cite as their influences, first of all, Alan Vega’s and Martin Rev’s legendary proto-techno duo Suicide (with which they were gigging in March 1998; not to mention the recorded collaboration with Alan Vega), industrial pioneers Throbbing Gristle and Einstürzende Neubauten, the French “musique concrète” composer Pierre Henry and the eccentric cult rockabilly musician Hasil Adkins — Mika Vainio has sometimes jokingly called Pan sonic’s music “horsemeat rockabilly”. Their sound is, according to Mika, increasingly moving away from the regular 4-4 techno, and is now, for example, inspired by old Jamaican dub reggae and ska. And of course rockabilly, which Mika likes with a late-70′s Eno-ish twist. Unsurprisingly, Japanese noise artists, such as Pain Jerk, have lately inspired Pan sonic. Mika considers their Japanese gigs with Yamatsuka Eye of The Boredoms some of the most important during their career; especially the Tokyo night was received very well among the press and the audience. Furthermore, Mika and Ilpo are into Hurriganes [sic], the “legendary” Finnish power trio of rock’n’roll Neandernthals back in the 70′s (the band’s drummer-singer Remu couldn’t speak English, so the lyrics were written phonetically for him, and so on). Mika isn’t really into today’s “electronica” and its computer-driven sound, though Pan sonic have increasingly delved into modern sampler technology as of late. The group also has an “extra member” called Jari Lehtinen who’s responsible for building Pan sonic’s instruments with which their extraordinary humming sounds have been created. Mika describes their custom equipment: “We have a synthesizer which is one big box that has twelve oscillators on it; you can connect them to each other and modulate them together. We also have this small synthesizer which is built to an old typewriter — we call it ‘Typewriter’. We have several drum modules to make rhythmic sounds which we are using with an 808. Jari Lehtinen is also building us this large synthesizer that will have eight oscillators and a cross connection board, like the early 70s, late 60s synthesizers.” Alongside Typewriter, also known as “Complex Sound Generator” there is also a self-built, approximately six metre-long infrasonic tube, called “John Holmes”. Pan sonic now use also samplers and a computer based sequencer, MPC2000. So they can leave the “fishing box” back home since it doesn’t travel well. Mika says he doesn’t really know anything about computers or MIDI-based music nor does he want to. He is very much into sounds felt by the body and the effect of frequencies on the brain. Pan sonic thinks they usually have their best gigs in Germany, because of the electronic music tradition there from the 1950′s onwards. They also mention France for the same reasons. Americans in their turn, Väisänen laughs a bit ironically, consider everything coming from Europe being automatically of very high quality, since this continent is regarded there as a kind of “cradle of culture”. Pan sonic’s performance with David Crawford and Hayley Newman at Rude Mechanic event took place at South London art space Beaconsfield during November 1996. The musicians isolated themselves in the concrete bunker of Beaconsfield, condemning themselves to fill every hour of every day between 10am and 6pm with the ever-present seisms of Pan sonic, that would be augmented with extra sound input from a series of invited guests, like Jimi Tenor, Bruce Gilbert or Scanner. Panasonic released a 12-inch with their long-time hero Alan Vega, the vocalist of legendary Suicide, called “Medal”, at the end of January of 1998. A full-length album of Pan Sonic’s sessions with Vega, Endless, was out early July on Blast First, Vega being very happy with the end result. Pan sonic had been working for Japanese fashion houses, providing soundtrack for their shows in Paris, with Comme des Carçons, and Tokyo. Early February saw the exhibition of Scandinavian modern art at the Museum of Modern Art in Paris, for which Mika Vainio built a sound installation based around Björk’s videos and the works of British multimedia artist Jeremy Deller (known also for his Acid Brass album and ***K The Millennium project of former KLF members). Also some co-operation with the German FM Einheit (ex-Einstürzende Neubauten) is expected during this year. Mika Vainio provided another sound installation for the art gallery Titanik’s ten year celebration in Turku, after which Pan sonic toured the US West Coast, starting in San Francisco at the end of May, and continuing during early summer. Pan sonic also created a test tone specially for experimental London radio station Resonance 107.3 FM, which was broadcast on 10 June, 1998. Following in the footsteps of his Sähkö label mates Tommi Grönlund and Jimi Tenor, Mika had now moved to live in Barcelona, Spain, where, it could be said, they had a small Finnish techno colony (afterwards, Tommi moved back to Helsinki and Jimi to London). Also Ilpo Väisänen regarded Barcelona, Spain, as his “homebase”, but promised he wouldn’t lose his Turku home for its being an ideal place for relaxation. As far as the members’ solo projects go, Ilpo Väisänen will participate in with the art gallery Titanik’s group exhibition later this year (Väisänen was a member of the managing board of the art gallery up to the mid-90′s), and should soon also release music of his Jarru (“Brake”) project on Turku’s Mind Records label. On the 29th of January, Ilpo Väisänen DJ’d at Turku’s Funky Kitchen club as DJ Leggo Fat, thus having a rare appearance in his home country, where Pan sonic was not going to be seen before September 1999, at least. Both Mika Vainio and Ilpo Väisänen should release one “episode” on Raster Music’s and Noton’s “20′ To 2000″ project, where a CD of 20 minutes is released every month from such electronic artists as Thomas Brinkmann and Scanner. The recordings for the new Pan sonic album started on February 1998, and the end result called A was released on February 22, 1999; the EP, B, followed on March 29, 1999. Mika and Ilpo said about the name of the album: “We had to drop the letter ‘a’ from our name, so that’s where the album title came from. It all happened about a year ago , Panasonic sent a legal letter to Blast First. But the letter was from Panasonic in the USA, we never heard anything from Europe or Japan. It did take a lot longer than we thought it would, we were expecting it would happen really quickly.” In February 1999 Pan sonic also had a show in London with the Japanese noise artist Masonna. For Pan sonic’s 1999 schedule, a four-week European tour was planned from March onwards in France, Switzerland, Germany, Italy and Belgium. The last gigs of the tour were cancelled, though, since Mika suffered from a very bad case of tour exhaustion. However, May’s North American dates with postrock band Trans Am were held as scheduled. At Barcelona’s Sonar festival Pan sonic, as the “mascots” of festival, threw a Jamaica-themed beach party as Puumiehet (“Wood Men”). September 1999 saw them coming back to Finland, playing in Turku’s Dynamo, Tampere’s Club Telex and Helsinki’s Saunabar. The second in their collaboration series (No 1 was V.V.V., Pan sonic with Alan Vega of Suicide) was completed early 2000 – V.V.E. (with F.M. Einheit, ex of Einstürzende Neubauten), being called Muftis Guesthaus and having a sleeve painting by Caspar Brötzmann. Expected out for late 2001. There were supposed to be V.V.E. shows in London & Munich, maybe more. Mika released a new solo album for TOUCH, called Kajo (“Glow), in April. Ilpo was supposed to release his first solo album proper via Mego, Austria, some time during 2000. Ilpo’s album echoed his original inspiration, old reggae music. Pan sonic were also contributing to an installation in a group show curated by David Toop, called Sonic Boom, at Hayward Gallery, on the South Bank, London, 27th April – 18th June 2000. Their work was called “2 x 50 Hz Thru Leslie Speaker”. Pan sonic sound art has also been heard at the Walker Art Center of Minneapolis, Chicago’s Museum of Modern Art and Foundation Cartier of Paris. On May Pan sonic had a concert at the Queen Elisabeth Hall of South Bank Centre, the home of London Sinfonietta, together with FM Einheit and Caspar Brötzmann. The ensuing infernal noise made at least the fourth of audience flee in horror. The good news was that Pan sonic completed recording the music for the new Nissan Almeria car, world-wide ad campaign; directed by Brian Griffin, who has also created the two Pan sonic videos to date (Urania & Endless) at Mute studios, London. The track is based on the first track from “A” with extra sounds, but with no sound effects or voice over. The bad news was that Nissan ended up using a track by – of all people – Moby. Pan sonic performed as an opener for the Wire at Irving Plaza, NYC on May 15, 2000. Pan sonic also played in Buenos Aires (an offal & meat eating capitol) on May 18th & DJed with Jeff Mills on May 19th. V.V.E., Pan sonic’s collaboration project with FM Einheit, performed live at Barcelona’s Sonar festival on 16 June. FM Einheit’s additional stage show with a piece of scrap metal with microphones and rocks made blood run from the hands and forehead of the artist as the rocks hurled around uncontrollably. 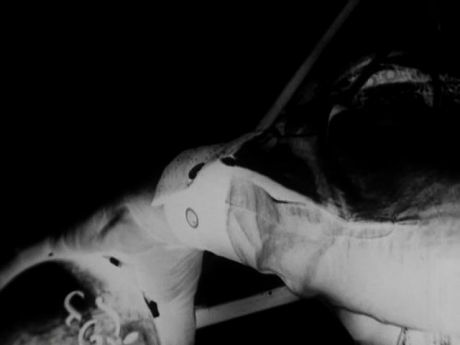 A Pan sonic documentary of 50 minutes, Kuvaputki (“Cathode ray tube”), directed by Ed Quist, also had its premiere at Sonar. Critics compared the black and white film to early rock’n’roll documentaries. August 2000 saw Pan sonic gigging in their former hometown Turku in Finland, at Koneisto festival where the astonished journalists of The Wire witnessed the audience clapping their hands to Pan sonic’s beats and Mika smiling(! ); with more Finnish gigs coming in November, at Helsinki’s Avanto festival and Tampere’s Club Telex (Mika Vainio together with Mego’s Fennesz). There was a new Pan sonic album out on Blast First! early 2001, called Aaltopiiri (“Wave circle”). They were still looking for exotic and different places to perform at, instead of the usual rock clubs, galleries or festivals, such as the Easter Islands or Ilpo’s favourite, Tijuana. Late 2001 saw Pan sonic’s collaboration album with British composer Barry Adamson (known for his film soundtrack) on Iceland’s Kitchen Motors label. 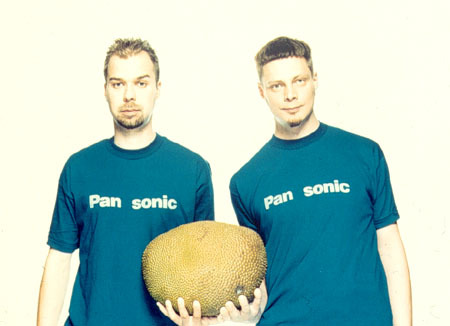 In 2002 Pan sonic performed among all with Chicks on Speed in London and Peaches at Barcelona’s Sonar. 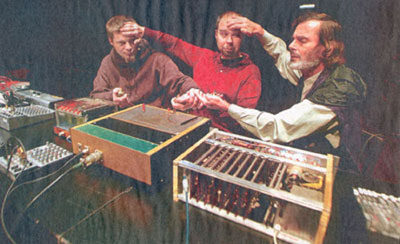 They also played at Helsinki’s Avanto festival, November 2002, on instruments built by Finnish electronic whiz Erkki Kurenniemi in the late 1960s and early 1970s. The new collaborative project of German Dirk Dresselhaus (commonly known as Schneider TM) and Ilpo was called Angel. They improvised live, mixing together old industrial, minimal and noisy wall of sound, releasing a 12″ on French Bip-Bop label in late 2002, and both Ilpo’s and Angel’s tracks appeared on Bip-Bop Generation Vol. 6 compilation. Ilpo’s new solo album Joulu (“Christmas”) to appear on Wavetrap (UK) was announced. Pan Sonic also completed a new collaboration with Suicide’s Alan Vega. Pan sonic played in Moscow, Russia. Pan sonic’s 2002 appearance with Erkki Kurenniemi appeared on Mika Taanila’s DVD The Dawn of DIMI. It also was announced that Pan sonic was going to perform at the industrial pioneers Throbbing Gristle’s reunion event in May 2004.